Krabi to Phi Phi gets you from the mainland of Krabi Province and Koh Lanta to one of the jewels in Thai Island hopping. No island on the west coast has caprturesd the imagination of the well-heeled to the backpacker like Phi Phi Island with it's stunning scenery and Maya Bay magic. Getting from Krabi to Phi Phi is one of the islands most pleasing ferry trips. The ferries leaving Krabi Province depart from Ao Nang Beach, Railay Beach, Krabi Town and Saladan Pier on Koh Lanta. The views of all the islands, the aqua marine blue of the sea and the striking cliff outline of Phi Phi on the horizon makes this a trip you can do again and again. Krabi to Phi Phi timetable make it easy to just hop on a ferry. If you are getting from Krabi to Phi Phi Luxury resorts you will have to double back on yourself if you take the normal ferries. The Phi Phi Don Pier is around at Tonsai Bay but all the ferries except for the one from Koh Lanta pass the resorts on the way in. It's not too inconvenient as the Zeavola Phi Phi Resort, Holiday Inn Phi Phi Island and Phi Phi Island Village Resort And Spa send a welcome party to meet you and take you to reception. Going from Krabi to Phi Phi mid-range accommodation will offer you a wide range in accommodation. Most of it is beachfront in the main village near the pier but Long Beach and Pak Nam beach also have some excellent rooms to consider. Getting from Krabi to Phi Phi budget accommodation is straight forward enough as the majority of it is at the main village around the pier. There are many guesthouses, hostels, dormitories simple bungalow complexes all through the centre of the village and on the outskirts on the lower slopes of the mountains. The main route from Krabi to Phi Phi is from the main provincial town of Krabi. Krabi Town has all the administrative offices as well as police, hospital, airport facilities. It is also the local hub for all inbound travel from the rest of Thailand, and Malaysia and Singapore. The ferry takes you out through the primordial mangrove forest and timeless sand flats to gain your first views of the mountains. 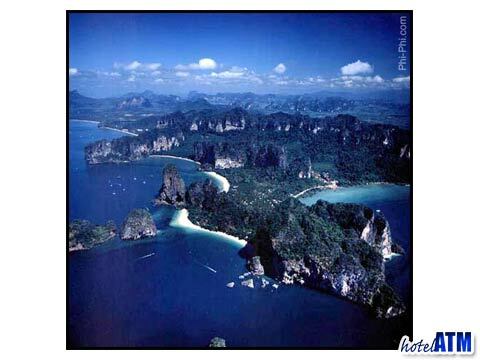 These are not Phi Phi but the the Phrang Nga promontory where you find Railay Beach. Sailing out past Chicken island Bamboo Island you get to Phi Phi In 1 hour and 20 minutes. Ferry departs at 10.00 am and 13.00 pm. The Ao Nang Krabi to Phi Phi takes you from the other side of the Phrang Nga promontory where you find the main Krabi Beach resort of Ao Nang. This 08.30 am ferry (the Ao Nang Princess) returns from Phi Phi at 15.30 pm. The ferry is a wonderful cruise between the islands of Phra Nang before heading out to towards Phi Phi. Railay beach is cut from the mainland and can only be reached by ferry or long tail taxi. It is an extraordinarily pretty natural formation of cliff and sand. The Ao Nang Princess picks up at Railay Beach on it's way out to Phi Phi. 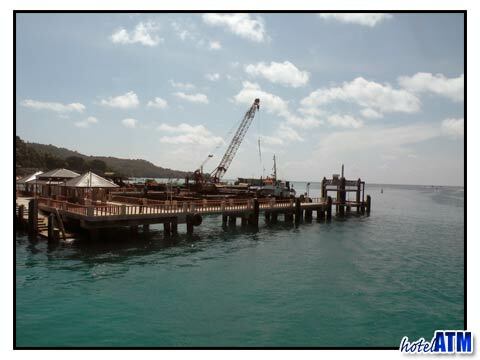 This ferry is the same one as used if you are departing Ao Nang Beach, Klong Muang Beach and Noppharat Thara Beach. This 08.45 am ferry returns from Phi Phi at 15.30 pm. Koh Lanta is to the south and east of Phi Phi and has the shortest Krabi to Phi Phi crossing. These ferries are not large and stop from 20th April until 1st November to avoid the weather of the westerly monsoon wind and waves. The 8.30am ferry departs Saladan pier in the far north of Lanta and makes it's way over open sea with Phi Phi Island firmly in it's sights. Phi Phi mountains can be seen from Koh Lanta. More useful information about going from Lanta to Phi Phi overland in low season can be found here. It basically involves taking a ferry to Koh Lanta Noi and then another chain ferry to the main land and the bus to Krabi Town. Such is island hopping.